Today in 1978, Albino Luciani, the Patriarch of Venice, was elected the Roman Pontiff. He took the name, Pope John Paul I. The papacy of John Paul was 33 days long. His cause is being studied for possible beatification. On this day in 1978, the Cardinals elected Cardinal Albino Luciani, 65, as the Pope to follow Pope Paul VI who died on August 6. Luciani took the name John Paul and died 33 days later. Luciani had been the Patriarch of Venice. On this day in 2002 the diocesan phase studying the possible cause for canonization was opened. It was closed in 2006 and the Roman phase opened in 2009. A miracle is being proposed for the Pope’s cause. John Paul I, pray for us. Many of us only know the name Albino Luciani. 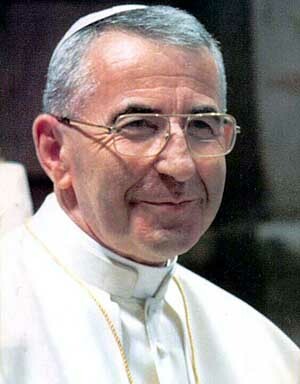 He was the one who became Pope John Paul I in 1978 and lived only 33 days as the Supreme Pontiff. 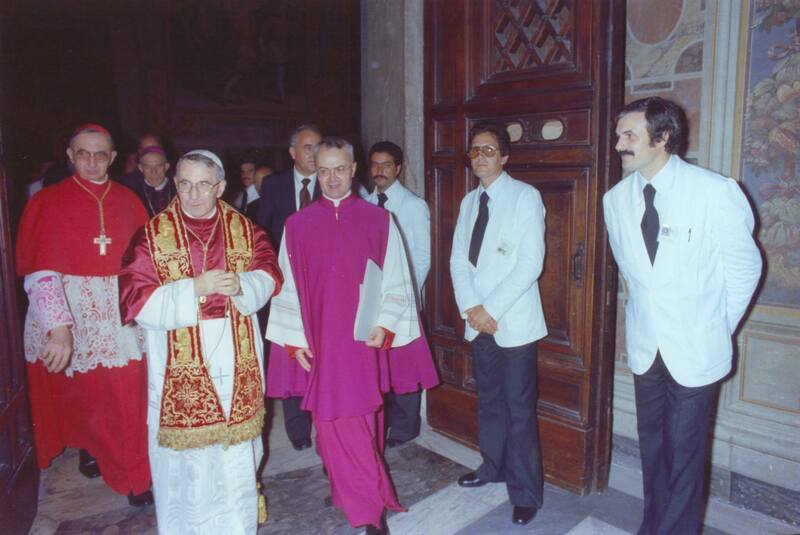 That was 34 years ago; I was only 9 when the smiling pope appeared and then departed. I often think of what the face of the Church would’ve been like had he lived longer. Celebrating the 100th birthday of Pope John Paul I (17 October 1912), L’Osservatore Romano and Il Messaggero di sant’Antonio organized a symposium on November 8 learn more about this enigmatic man. An editorial in L’Osservatore Romano gave but a peek of what was learned. Indeed, it’s interesting to hear that JPI followed three assumptions: “detachment from the world, obedience to superiors, and absolute faithfulness to the institution” in his ministry and that he was a lover of books. Me too. Apparently, JPI liked authors as diverse as Aesop, LaFontaine, Mark Twain (his favorite) to Chesterton and Dickens, among many. He also liked rock music and the comics. For a priest of the mountains he was an educated, curious and humane person. His cause for canonization is being studied. Luciani spoke of the Second Vatican Council using soccer terms. Good for him. He got the point across to those who likely wouldn’t know where to begin to understand the complexities of a Ecumenical Council. Read the editorial for yourself. Today is the 34th anniversary of papal election of Albino Luciani as Pope John Paul I. He’s remembered for being the smiling pope and the pope who reigned for 33 days. In some way, Divine Providence gave us this gift and then opened the door for yet another. John Paul’s cause for canonization is being studied. O God, faithful rewarder of souls, grant that your departed servant Pope John Paul I, whom you made successor of Peter and shepherd of your Church, may happily enjoy for ever in your presence in heaven the mysteries of your grace and compassion, which he faithfully ministered on earth. George Weigel gives his reflections here. Earlier this morning I was poking around the Vatican website reading some of the pieces posted in the section on Pope John Paul I. The General Audience of September 6, 1978 is a striking reminder of how a Christian ought to live: in a mode of gratitude. The Pope’s address is so simple that the profundity is extraordinarily beautiful and reasonable. 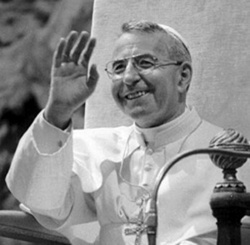 Pope John Paul I did very few things in his month long pontificate that after reading some of the things I did today, I wonder with awe of this man, a pope, a witness to Jesus Christ who went prematurely to the Lord. Or did He? “I am only dust and ashes before you, O Lord!” We must feel small before God. When I say, “Lord I believe” I am not ashamed to feel like a child before his mother; one believes in one’s mother; I believe in the Lord, in what he has revealed to me. The commandments are a little more difficult to observe; but God gave them to us not to satisfy a whim, not in his own interest, but solely in our interest. Here are the commandments. Honour your father and your mother; do not kill; do not get angry; be gentle; do not tell lies; do not steal… If we were able to observe the commandments, we would be better off and so would the world. Then there is our neighbour… But our neighbour is at three levels: some are above us; some are at our level; some are below. Above, there are our parents. The catechism said: respect them, love them, obey them. The Pope must instil respect and obedience in children for their parents. I am told that the choir-boys of Malta are here. Let one come here, please … the choir-boys of Malta, who have served in St Peter’s for a month. Well, what is your name? –James. And listen, have you ever been ill? –Oh, how lucky you are! But when a child is ill, who brings him a little broth, some medicine? Isn’t it his mother? That’s it. After wards you grow up, and your mother gets old; you become a fine gentleman, and your mother, poor thing, will be in bed, ill. That’s it. Well, who will bring the mother a little milk and medicine? Who will? –Well said! “His brothers and he,” he said. I like that. Did you understand? But it does not always happen. As Bishop of Venice, I sometimes went to homes. Once I found an elderly woman, sick. –Well, the food is all right! –Are you warm? Is there heating? –“No” She almost began to cry. –But why are you crying? –My daughter-in-law, my son, never come to see me. I would like to see my grandchildren. Heat and food are not enough, there is the heart; we must think of the heart of our old people. The Lord said that parents must be respected and loved, even when they are old. And besides our parents, there is the State, there are superiors. May the Pope recommend obedience? Bossuet, who was a great bishop, wrote: “Where no one commands, everyone commands. Where everyone commands, no one commands any longer, but chaos.” Sometimes something similar is seen in this world too. So let us respect those who are our superiors. People work more willingly when their work is recognized. These are the little acts of charity. In our home we have all some one who is waiting for a compliment. There are those who are smaller than we are; there are children, the sick, even sinners. As Bishop, I was very close even to those who do not believe in God. I formed the idea that they often combat not God, but the mistaken idea they have of God. How much mercy it is necessary to have! And even those who err…. We must really be in place with ourselves. I will just recommend one virtue so dear to the Lord. He said, “Learn from me who am meek and humble of heart”. I run the risk of making a blunder, but I will say it: the Lord loves humility so much that, sometimes, he permits serious sins. Why? In order that those who committed these sins may, after repenting remain humble. One does not feel inclined to think oneself half a saint, half an angel, when one knows that one has committed serious faults. The Lord recommended it so much: be humble. Even if you have done great things, say: “We are useless servants.” On the contrary the tendency in all of us, is rather the contrary: to show off. Lowly, lowly: this is the Christian virtue which concerns ourselves.